Frequently asked questions about dementia. If you would prefer to talk to someone call the National Dementia Helpline on 1800 100 500. I am worried about my memory, what should I do? Finding out what is wrong is the first step to getting help. Have you become concerned about increasing lapses in memory or other changes in your thinking or behaviour? Changes in memory and thinking have a number of possible causes that may include stress, depression, pain, chronic illness, medication or alcohol, and sometimes early dementia. Major changes in memory are not normal at any age and should be taken seriously. If you are experiencing these kinds of difficulties, it is better to see your doctor sooner rather than later. There is no single specific test that can identify whether someone has dementia. A diagnosis is made by talking to you and perhaps a relative or friend to find out more about your difficulties with memory and thinking. You will also need a physical and neurological examination which will look at all other possible causes. The earlier you act, the better. Your symptoms may not be caused by dementia, but if they are, earlier diagnosis will be helpful. An early diagnosis means that you can have access to support, information, and medication. People with a diagnosis of dementia should have an opportunity to participate in planning the rest of their lives and their finances as well as indicating their wishes regarding future care. I think my partner has dementia. How do I convince them to see our doctor? Remember, many conditions have symptoms similar to dementia. It is important not to assume that someone has dementia just because some of the symptoms are present. Strokes, depression, alcoholism, infections, hormone disorders, nutritional deficiencies, and brain tumours can all cause dementia-like symptoms. Many of these conditions can be treated. The best place to start the diagnostic process is with your doctor who, after considering the symptoms and ordering screening tests, may offer a preliminary diagnosis or refer the person to a neurologist, geriatrician or psychiatrist. Some people may be resistant to the idea of visiting a doctor. In some cases, people do not realise, or else deny, there is anything wrong with them. This can be due to the brain changes of dementia that interfere with the ability to recognise or appreciate one’s memory problems. Others, with retained insight, may be afraid of having their fears confirmed. For more information on talking with your doctor and working with doctors, see our Help Sheets section of the website. What can Dementia Australia do to help me? Support can make a positive difference to managing dementia. We're here to provide the help you need, when you need it. Other programs and services in your area. I have difficulty with English. Do you have information that can help me? We have information to help you in more than 40 languages including Arabic, Armenian, Chinese, Croatian, Dutch, German, Greek, Hindi, Hungarian, Indonesian, Italian, Japanese, Khmer, Korean, Latvian, Laotian, Macedonian, Malay, Maltese, Polish, Portuguese, Romanian, Russian, Serbian, Spanish, Tagalog, Turkish, Ukrainian, and Vietnamese. Information in these languages is available here. 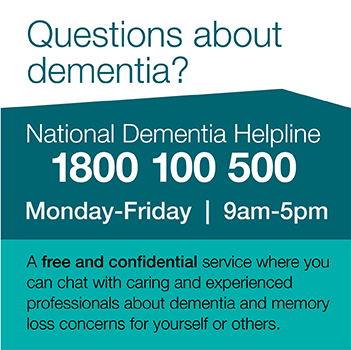 If you need assistance, phone the National Dementia Helpline on 1800 100 500. If you want an interpreter you can contact the Helpline through the Telephone Interpreting Service on 131 450. Yes you can! There are ways to reduce the risk of getting dementia and although we can't guarantee that you won't get dementia even if you 'do everything right', studies of large groups of people do show that those who adopt 'brain-healthy' lifestyles have a reduced risk of developing dementia. The biggest risk factors for dementia are getting older and your genes - things you can't do anything about. So, it is important to do what you can with the things you can control - your lifestyle and habits. Following the Your Brain Matters lifestyle may reduce your risk of developing dementia. See our Your Brain Matters website for more information. What is some of the latest research in Alzheimer's disease? Researchers are continually searching for new treatments for Alzheimer’s disease and other dementias. The potential treatments are in the early stages of research and are not currently available, but they are all part of the research effort to find more effective treatments for Alzheimer’s disease and ultimately a cure. For more information, visit our research website. I have a young child who wants to know what is happening to their grandparent. How do I handle this? Visit our website Dementia in my family. And see also our Help Sheets for young people and dementia. I'd like to learn more about how to care for my loved one with dementia. Do you offer a course I can attend? Our training courses provide valuable skills and support, and complement Dementia Australia's other services. We offer timely skills and knowledge in a supportive environment. Our educators are highly qualified and their experience in providing dementia care means they understand your needs. Visit our Learning section of this website for more information about the courses which you can attend in each state or territory. For more information call our National Dementia Helpline on 1800 100 500.